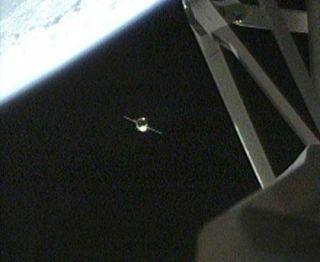 The Russian Mini-Research Module 2 (MRM2), also known as Poisk, approaches the International Space Station for docking on Nov. 12, 2009. Astronautson the International Space Station welcomed the arrival of a brand-new Russianmodule Thursday, an orbital room adds more research space and an extra parking spot forvisiting spacecraft. Theunmanned module Poisk, which means ?explore? in Russian, docked smoothly at a berthon top of the space station as they flew 222 miles (357 km) over northernKazakhstan in Asia. ?Thearrival of thisnew module for the Russian segment went great,? Russian cosmonaut Maxim Suarevradioed Mission Control in Moscow after the smooth docking. Suarev and fellowcosmonaut Roman Romanenko were poised to take remote control of the automatedPoisk if the craft strayed off-course, but it flew true as expected. The moduledocked at 10:41 a.m. EST (1541 GMT), just four days ahead of NASA?s own launchof the shuttle Atlantis to the orbiting laboratory. The six astronauts set toblast off on Atlantis Monday headed to NASA?s Kennedy Space Center in Floridatoday to prepare for their upcoming flight. Poisklaunched Tuesday and is the first new Russian addition to the space stationsince the 2001 launch of the Pirs docking compartment, which is due to bediscarded in 2011, NASA officials said. The space station has been underconstruction since 1998. Also knownas the Mini-Research Module 2, Poisk can serve as a vital fourth Russiandocking port for the station, as well as an airlock for Russian spacewalks. It can also be used as research space or as a storage room, astronauts have said. The stationnow has five docking ports in all, one on the American side for visiting shuttles and four on theRussian segment to host crew-carrying Soyuz vehicles and unmanned cargo ships. UnmannedJapanese cargo ships can also be attached to berthing points on thestation?s American segment. Because thespace station?s full crew increased to six people this year, two Soyuzspacecraft are required to be docked at all times to serve as ferries to Earthand emergency lifeboats. Before Poisk?s arrival, that left only one remainingparking spot for cargo ships and other Soyuz vehicles bringing new crewmembersto the station. Poisk?s rooftopdocking port should ease traffic concerns for flights to and from the station,NASA officials have said. ?Havingfour ports is a really big deal,? NASA?s deputy space station program managerKirk Shireman told SPACE.com. ? ?It gives us a lot of flexibility.? The Poiskmodule is just over 13 feet (4 meters) long, about 8 feet (2.5 meters) wide andweighs about 8,000 pounds (17,636 kg). It has about 380 cubic feet (10.7 cubicmeters) of actual living space inside. The station room launched with about1,764 pounds (800 kg) of cargo for the station?s six-person crew. NASAspokesperson Rob Navias said the supplies delivered aboard Poisk includes watersupply gear, crew hygiene supplies, medical equipment, personal items and spareparts. It willtake some time before Poisk is ready to host visiting spacecraft or spacewalks. First, themodule?s rocket engine section must detach in December to clear the top-mounteddocking port. Russian cosmonauts will perform a spacewalk in January to outfitthe port to accommodate spacecraft, then make the first docking later thatmonth, mission managers said. ?It?s goingto be a new capability for us,? Shireman said, adding that Soyuz crews will nowbe able to see the Earth behind the station when they dock at Poisk. ?We?ll haveneat viewsof the station that we haven?t seen before.? Poisk isone of three new Russian modules to be launched to the station over the nexttwo years, NASA officials said. Its counterpart, the still-unnamedMini-Research Module 1, will be delivered in May 2010 aboard NASA?s shuttleAtlantis. Poisk launched first because it was ready earlier. A much largerroom, currently called the Multipurpose Laboratory Module, is slated to launchin 2011 to replace Pirs, NASA officials added.